How is technology changing welfare for the Disabled? Disabled people have been forced to rely on a member of their family, friend or caregiver to do things that they can no longer do but thanks to the recent advancements in technology the welfare of the disabled is changing for the better. They can do things that we’re once impossible and can use these skills to express themselves. A new exciting range of technologies has given the disabled the opportunity to control mouse movement with just their eyes. It’s not just about advances in technology though. The disabled are now able to sell and purchase approved Used Mobility Scooters which can save them up to 3,000. Some of the technology we see and use on a daily basis can be used in different ways to help the lives of the disabled, such as using tablets to speak or using voice control to navigate mobile phones. 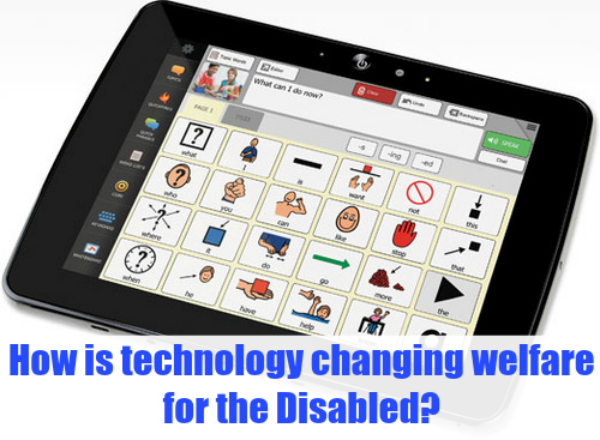 The expense of these devices has worked in favor for both language and speech therapists. Apps including ‘Speak for Yourself’ allow therapists to work alongside disabled individuals to help then gain access to over 10,000 at the press of a screen. This has helped improve communication skills among people with autism. Parents and teachers have begun turning to tablets and other portable devices to help their children communicate effectively and practice their eye contact whilst learning new vocabulary. Apples assistive touch has also made room for those that suffer from a disability to use devices in a different way. For those that are unable to type or use a touch screen, voice command technology gives them the opportunity to control their device with the use of their voice. Now, voice command technology is being used across an array of products, including cars and e-readers. Eventually, visually impaired individuals will be able to use devices equipped with GPS to guide themselves safely. In the future, they will be able to get themselves from A to B in cars that don’t require a driver. This provides the disabled with self-confidence. Those that struggle on a daily basic with simple tasks we do without realizing start to lose self-confidence. They get frustrated with the fact that they are unable to do these things, whatever they might be, without assistance. This can result in the feeling of failure and even encourage depression. New technology brings that additional needed hope back into the lives of those that continue to feel disadvantaged and isolated from others. By helping them feel more independent rather than dependent; they can build a sense of achievement and be proud of what they have accomplished on their own. More than 19% of the working population suffer from a disability and more than 10million of those live in Britain but thanks to technology, the world is changing for the better. The things we take for granted everyday are a step into the light for others. Mobile devices are no longer designed to make phone calls and to search the web; they provide disadvantaged people with the opportunity to communicate and feel as sense of freedom.